Dr. Kara M. Cooney, Ph.D. In ancient Egypt, was it a socially approved custom to take a coffin made for someone else and reuse it? Over the past decade Egyptologist Kara Cooney's ongoing research on 21st Dynasty coffins has attempted a wide scale systematic examination of coffin reuse to understand the scale and methods used by ancient craftsmen. To date she has examined nearly 300 coffins in museums across the world, including those from two famous burial caches in Thebes, known as the Bab el-Gasus Cache and the Royal Cache. 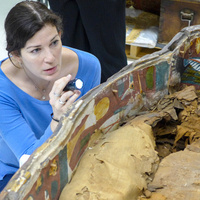 This lecture will highlight findings from her study of 21st Dynasty coffin reuse, investigating the methods of reusing another person's coffin, who reused coffins, and how funerary arts reuse and theft impacted the way that ancient Egyptians approached funerary materials and rituals during a time of social crisis and after.